Thad Grenier of Woonsocket said “A lot of big fish around from what I am seeing.” He and friends caught ten keeper tautog (above 16”) fishing at Conimicut Light Sunday. Largest fish was eight pounds. Chef Ralph Battista of Luigi’s Restaurant & Gourmet Express, Johnston, serves a sampling of calamari to RISAA Treasurer Peter O'Biso with son Matt after “How to cook fluke” RISAA presentation. Both Battistas are avid fluke anglers too. Fluke experts Capt. Rick Hittinger, Capt. Ron Hartman and Bob Murray offered tips on how to catch fluke at Monday’s RI Saltwater Anglers Association meeting. Tautog season ends for the spring at the end of the month. Big fish are being caught at Conimicut light, Hope Island and off coastal shores. Thad Grenier of Woonsocket said he and friends caught ten keepers and two shorts when fishing at Conimicut Light on Sunday. Thad said, “Tide hasn't played a major factor, but was the best just when the tide was beginning to turn. (Used a) simple rig, dropper loop 6-8 inches above sinker, I snell the hook and make sure there is enough of a leader to reach the bottom barely . All caught on Asian crabs. A lot of big fish around from what I am seeing. Caught 4 over 8 lbs. Only three shorts caught all weekend under 16 inches. Best tog fishing I’ve had in years.” Ken Landry has been landing tautog every day in the Hope Island area said Ken Ferrara of Ray’s Bait. Summer flounder is picking up offshore with the Frances Fleet reporting a strong bite for May. Roger Simpson said, “Best day of the (week) was last Sunday where the first angler limit was recorded and there were many fish in the 3 to 4 lb range. 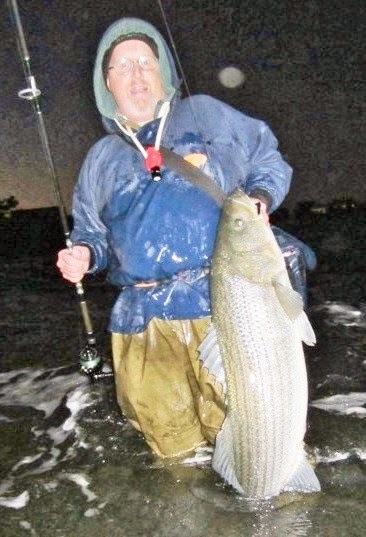 Monday had the week’s biggest fish with a seven pound slab.” Not many anglers are targeting fluke yet as most seem to be concentrating on striped bass and tautog. Fresh water fishing is good. John Wunner of John’s Bait said, “The trout fishing in all the ponds stocked by DEM has been outstanding. Customers are very excited about DEM’s Golden Trout program. There have been a lot of anglers fishing for them.” Largemouth bass fishing has been good too, added Wunner. Save the Sound, a program of Connecticut Fund for the Environment, and University of Connecticut – Avery Point will host a public forum today to discuss the state of our nation’s ocean fisheries, the laws that affect them, and the role they play with fishing conditions in the northeast. I will be one of five panelists at the form today, the only fishermen. Scientists, fishermen, policy implementers, educators, and advocates will discuss the need for the federal government to reauthorize the Magnuson-Stevens Fishery Conservation and Management Act (MSA), which has helped 32 species recover since 1976. In-part, the purpose of the forum is to bring attention to eco-system based management principles so that the Reauthorization of MSA will provide fish managers with eco-system based strategies and management tools. Simply put eco-system management takes a broader view when managing our oceans. Looking at the entire eco-system, rather than individual species as everything in the ocean is related. For example we should not just manage Atlantic Menhaden to ensure there are enough of them left in the water to be sustainable, but manage them also for their value to the entire eco-system… their value to striped bass and other species as forage food, their value to coves and saltwater estuaries as filer feeders, etc. Here are highlights of what I plan to say during opening remarks today. Panelists noted below. Our efforts with the MSA to date have rebuilt many of the stocks we fish such as summer flounder and striped bass. In the future I believe we will see greater recreational and charter fishing accountability, to not only ensure sustainable fisheries, but to help cultivate abundant fisheries. Abundant fisheries that will enhance the chances of catching a fish (and large ones at that), this is why many people fish recreationally. Whatever creates an abundance of fish is good for recreational fishing and charter fishing. So the idea of a healthy abundance of forage fish, enabling sanctuaries, lower by-catch and discard rates, robust catch and release efforts, and eco-system based management is good for the fish. Abundant forage fish will cultivate and grow an abundance of the fish that can be caught. Some examples of climate change impacting our fisheries include a movement of fish into the region that are not ordinarily there. For example during the past several years anglers in the RI have caught more cobia than ever before. Although anecdotal, this is a good example of a warm water fish moving into our region. Cobia traditionally winter off the Florida coast and then migrate to the Carolinas… yes the Carolinas not Narragansett, RI. Yet a number of them were caught in RI last summer. There are no recreational fishing regulations on the books in RI for Cobia, no management measures to prevent overfishing. So, if cobia continue to be caught in RI it would make sense to establish science-based management before fishing is allowed. This is the type of flexibility should be included in the Reauthorization of the MSA. A second example would be the slow and steady migration of flounder. Research has shown that with the slow and steady increase in water temperature off the continental shelf, yellow tail and summer flounder abundance has moved from off Maryland to CT, RI and now Massachusetts anglers are catching summer flounder in larger numbers too. Initially, this lead to overfishing, primarily due to abundance and increased effort. We now have better control and the stock has rebuilt in our area. My business has benefited greatly from the abundance of summer flounder. Most charter trips now target fluke as well as striped bass. And more and more recreational anglers and charter captains are targeting just fluke on fishing trips. And lastly, our cold water fish, cod in particular, are moving offshore… not necessarily moving north but moving further out to sea for cooler, deeper water, out of the reach of many anglers and charter boats. As a consequence the number of cod and the number of charter boat cod trips has been drastically reduced in recent years. Overall I have found recreational anglers and charter captains to be conservation minded because they know that with an abundance of fish their odds of catching fish, and larger fish are much greater, so they are willing to engage methods that will enhance abundance. As a fisheries policy maker I am often torn between user group needs… such as commercial fishermen needing to fish to survive and thrive, recreational fishermen want an abundance of fish close to shore to catch, and energy developers want low water areas (often hot fishing grounds) to place their turbines on to keep costs down. But the key to success I believe is to always keep the interest of the fish first and foremost before any user group as with an abundance of fish everyone wins, with few fish or no fish, everyone loses. The Narragansett Chapter of Trout Unlimited (#225 ) will host its regular monthly meeting on Wednesday, May 28, 2014, 6:00 PM, at the Arcadia Management Area Check Station, Rt. 165, Exeter, R.I. This will be the first of four successive monthly Stream-Side meetings at the check station. Hot dogs, hamburgers and beverages will be available. All members and guests welcomed. Pease contact chapter president, Ron Marafioti, at (571) 643-1452, with any questions. Save the Sound, a program of Connecticut Fund for the Environment, and University of Connecticut – Avery Point will host a public forum today to discuss the state of our nation’s ocean fisheries, the laws that affect them, and the role they play with fishing conditions in the northeast. I have the pleasure of being one of five panelist, here is the roaster of those presenting today. Forum panelists include Lee Crockett of The Pew Charitable Trusts in D.C., who leads Pew’s work to reauthorize and strengthen the MSA; Peter Auster, UCONN-Avery Point & Mystic Aquarium, Professor Emeritus of Marine Sciences & Senior Research Scientist; Stephen Gephard, Supervisor, Diadromous Fish Program and Habitat and Conservation Enhancement Program, CT DEEP; Jennifer Herring, President and CEO at The Maritime Aquarium in Norwalk, CT; Matthew McKenzie, Ph.D., Associate Professor and American Studies Coordinator at UCONN-Avery Point, Connecticut Obligatory Delegate, New England Fisheries Management Council; and Captain Dave Monti, No Fluke Fishing Charters, fishing columnist, member of the RI Marine Fisheries Council and NOAA’s Marine Fisheries Advisory Committee's (MFAC) Recreational Working Group. NOAA recently released their national and regional Fisheries Economics of the U.S. report (FEUS 2012). These reports cover a ten year time period and include descriptive statistics on recreational fishing effort, participation rates, and expenditure information; commercial fisheries landings, revenue, and price trends and much more. In 2012, almost 1.3 million recreational anglers took 6.2 million fishing trips in the New England Region. Of the total fishing trips taken, 51% were taken from a private or rental boat and another 44% were shore-based. Porgies (scup) was the most frequently caught species or species group with 6.5 million fish caught in 2012 and represented 33% of total fish caught in the region. In 2012, sales impacts were the highest in Massachusetts ($848 million in sales impacts), followed by Rhode Island ($192 million in Rhode Island). For a complete copy on NOAA’s economic impact study of fishing in New England and in other regions visit www.noaa.gov . An average of 1.4 million anglers fished in the New England Region annually from 2003 to 2012. In 2012, coastal county residents made up 89% of total anglers in this region. 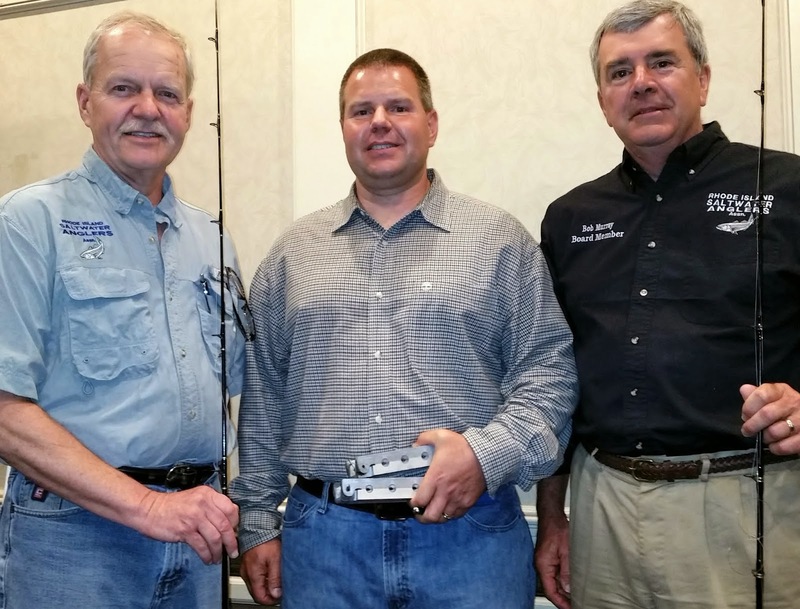 These anglers averaged 88% of total anglers annually over the 10 year time period. The largest annual increase in the number of coastal anglers during the 10 year time period occurred between 2004 and 2005, increasing 17%, from 1.2 million anglers to 1.3 million anglers. In the New England Region, an average of 8.1 million fishing trips were taken annually from 2003 to 2012. Private or rental boat and shore-based fishing trips accounted for 3.1 million and 2.7 million fishing trips, respectively, in 2012. Together these made up 94% of the fishing trips taken in that year. The largest annual decrease during the same period in total trips taken occurred between 2008 and 2009, decreasing 22%, from 9.1 million trips to 7.2 million trips. Striped bass was the most commonly caught key species or species group, averaging 7.1 million fish over the 10 year time period. Of these, 92% were released rather than harvested. Of the ten commonly caught key species or species groups, seven were released more often than harvested over this time period. The species or species group that was most commonly released was little tunny (94% released). The way to take care of the saltwater in our bays and oceans is to first take care of the fresh water that flows down into them from watersheds and rivers. This is exactly the aim of the Governor’s Rhode Island Bays, Rivers & Watersheds Coordination Team and they recently released an annual report outlining 2013 accomplishments. The coordination team is important as state water agencies have distinct and important responsibilities and authorities, but no single agency is responsible for all of the state’s fresh and marine waters. The Rhode Island Bays, Rivers, and Watersheds Coordination Team (BRWCT) conducts interagency strategic planning and facilitates program coordination for Rhode Island’s water resources and their human uses. Since 2007, the BRWCT invested $3 million in water resources management and sustainable development. The 2013 annual report relates collaborative pursuits by seven state agencies of storm water management, water-reliant economic development, climate change adaptation, and other shared priorities. For example the team made a multi-year funding commitment to the development of the Shoreline Change Special Area Management Plan (the beach SAMP) by the RI Coastal Resources Management Council and the University of Rhode Island. This effort will advance scientific understanding of sea‑level rise, shoreline erosion and inundation for the entire Rhode Island shoreline, educate coastal communities on these emerging risks, and provide the state with a road map for future coastal land use management and development decisions. Details on the development of the beach SAMP and other initiatives can be found in the 2013 annual report at www.coordinationteam.ri.gov. VIP fishing: Visually impaired persons fish aboard the Frances Fleet party boat. The 7th Annual VIP Tournament will be held on June 22 this year. 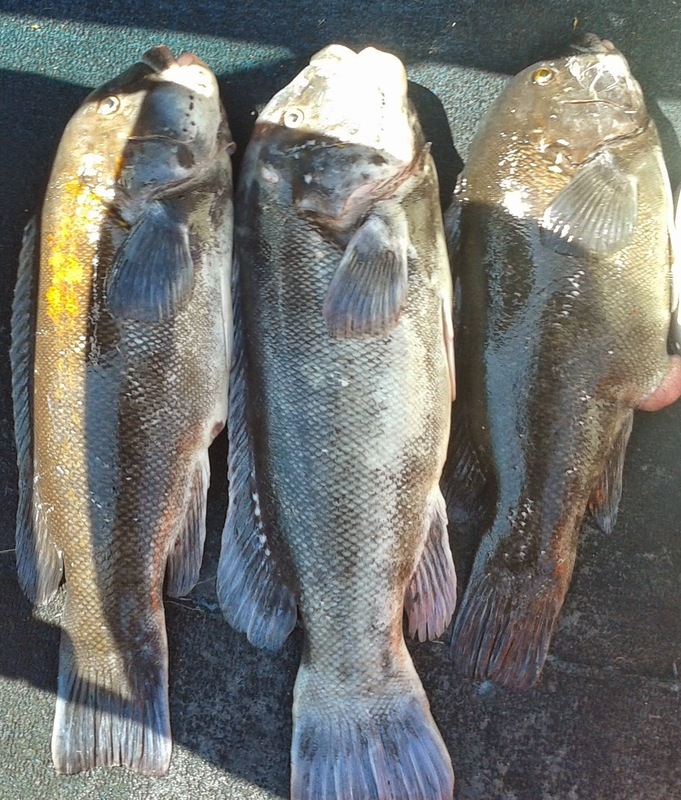 With warmer weather and a lot of bait (Atlantic Menhaden and squid) in Narragansett Bay and along coastal shores fishing broke wide open this week with tautog, fluke and striped bass. Here’s what is going on. Tautog fishing was heated up this week too. Angler Larry Norin said he fishied off shore this week for tautog, “Left Point Judith at 7:00 a.m. Three guyes fished for two and a half hours and we caught eleven fish, nine keepers to six pounds, all on crabs in 30-40 feet of water.” Ken Landry and friend caught tautog to 11 ½ pounds using both clam worms and green crabs. “They fished at Plum Point Light, General Rock and Ohio Ledge.” said Ken Ferrara of Ray’s Bait. Mike Wade of Watch Hill Outfitters said the tautog bite has been slow as not many anglers are targeting them this spring. Several anglers reported worm hatches in rivers and coves in Narragansett Bay this week. All it took was a few days of warm weather. Reports are from both the East and West Passages of the Bay and we can expect worm hatches in such places as Salt Pond in Narragansett, East Greenwich Cove, Allen Harbor, Wickford Cove, the Barrington and Warren Rivers in the West Passage as well as areas in Mt. Hope Bay. As related in an earlier column this year, fishing worm hatches for striped bass can be exciting and frustrating at the same time. Cinder worms are small spawning worms almost tadpole like in their movements. They have a wormlike body up top with a tail that wags through the water propelling them in an erratic fashion at fast speeds in circles through the water. Striped bass (bluefish too) key in on the spawning worms (often in May and June) and feed actively on the surface, close enough to the shore to be well in range of anglers casting with spinning reels or wading fly rod fishermen. They are also fished from boats on saltwater ponds, coves and in saltwater estuaries of all types. When the worm hatch is at its peak using a fly or bait that resembles a cinder worm may not be a good idea. If there is too much bait around the bass may not bite, however, if you present something different to the bass, to gain their interest, you could hook up with some nice striped bass. It’s all about getting the bass interested in what you have to offer and they can be finicky and difficult to catch during a hatch. However, when the hatch starts to slow down it may be a good idea to present bait that looks like a cinder worm as the bass may be hunting for the worms as they are getting scarce. 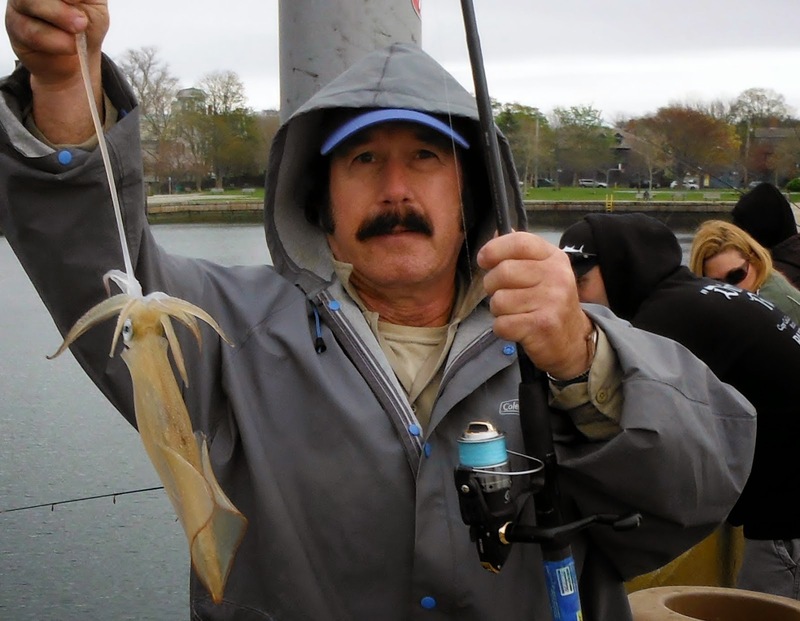 Watch Hill Outfitters, 157 Main Street, Westerly, will hold a free seminar on summer flounder (fluke fishing) Friday, May 16 from 6:00 p.m. to 9:00 p.m. Mike Wade, owner of Watch Hill Outfitters, said quest speakers will be Capt. Tom Logan of Fish-On-Charters and Cathy Muli of Jackpot Digger Jigs. Fishing gear and rig manufactures will be on hand as well. Call 401.207.4952 for reservations and information. A RI Saltwater Anglers Association (RISAA) summer flounder (fluke) fishing and cooking seminar will be held Monday, May 19. Captains Ron Hartman and Rich Hittinger along with local fluke expert Bob Murray will share tips from over their combined sixty years of fluke fishing experience. Chef Ralph Battista, executive chef and owner of Luigi’s Restaurant & Gourmet Express, Johnston, will talk about cooking fluke. Chef Battista is an avid angler who also loves to fish aboard his vessel Hook’n & Cook’n. Seminar at 7:00 p.m., West Valley Inn, Blossom Street, West Warwick. Non-members are asked to make a $10 donation, RISAA members attend free. 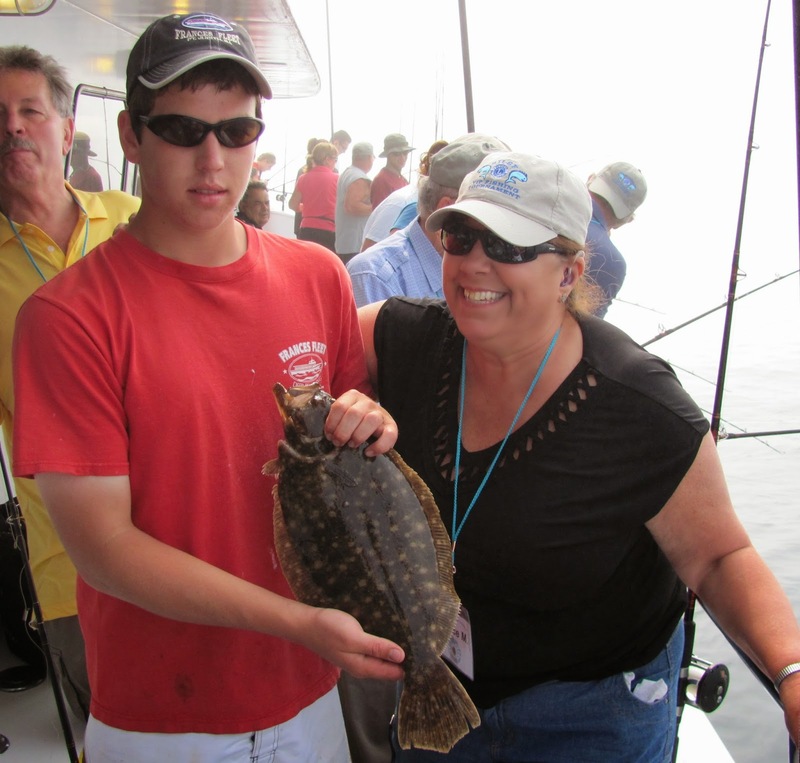 The RI Lions Sight Foundation (RILSF) will host their 7th Annual VIP Fishing Tournament for Visually Impaired Persons (VIP’s) of Rhode Island on June 22, 2014. 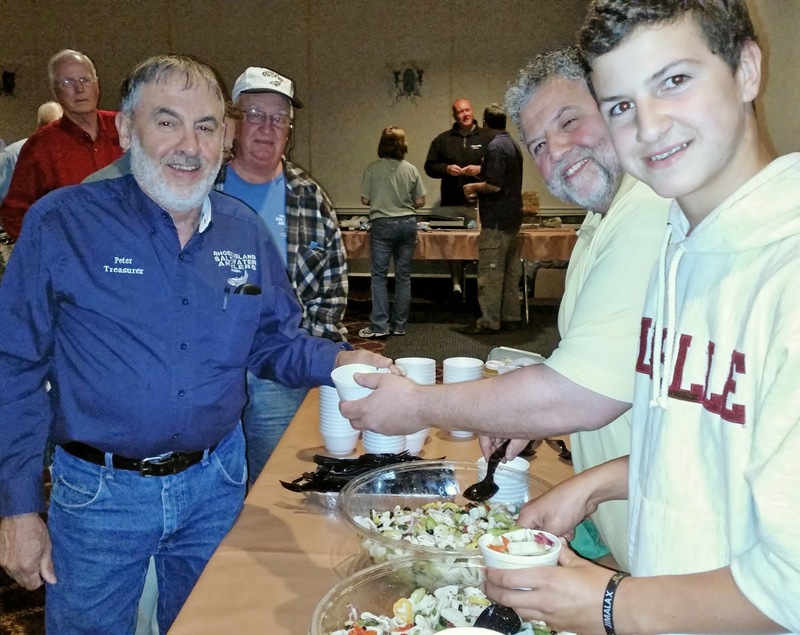 The Tournament, which takes place on a party fishing boat out of Galilee, RI, is supported through donations from RI Lions Clubs and individual donors. This year, the Tournament will also receive support from the Pabst Brewing Company through the Pabst Blue Ribbon Northeastern Fishing Tournament held from June through September (visit www.pbrfishing.com). The event includes breakfast and a half-day of fluke fishing followed by lunch and an awards presentation. Participants vie for the opportunity to represent Rhode Island at the Lions National VIP Tourney being held in October in North Carolina. The event is free of charge to all VIP’s and their guides. To be eligible participants are must be legally blind, at least 17 years old, are physically able to fish from a party boat, and must be accompanied by a guide (transportation and/or guides will be provided if needed). VIP’s and guides must fill out an application to participate. Visit http://www.lions4sight.org/index.htm or call Ken Barthelemy at 401-529-6173 for information. The Department of Environmental Management (DEM) and the RI Department of Health (DOH) will kick off their Great Outdoors Pursuit (Pursuit #1) Sunday, May 18, 11:00 a.m. to 3:00 p.m. at Lincoln Woods State Park. Subsequent “Pursuit” events will take place the same time of day on June 22 and July 27 with the final “Pursuit #4” taking place Saturday, August 9. The aim of the program is to encourage Rhode Islanders to reconnect with the great outdoors, get active and have fun. “Our Great Outdoors Pursuit gets families outdoors, where they can enjoy nature, get fit and have fun. Reconnecting children and families with the natural world will ensure a healthy future for our children and for our planet.” said DEM Director Janet Coit. Four of the Pursuits take place on specific dates in set locations and are guided by DEM staff and their partners. Guided Pursuits include free outdoor adventures such as biking, hiking, nature walks, fitness challenges, kayaking, fishing and rock climbing. They also include music, environmental and health-related exhibits and free raffles, give-a-ways and samples. Teams of children and adults will be challenged to visit different facilities and take part in outdoor adventures and learn about environmental and health issues over a 12-week period. They earn points for each “Pursuit” event they attend and can win prizes valued up to $1,000 at the Grand Finale. Each team must include a minimum of two people – one member over age 18 and one member under age 18. There is no limit on the number of members that each team may have. This year program partners include United Healthcare, Verizon, Clivus New England, Fort Adams Trust, Blackstone River Valley National Heritage Corridor, the YMCA, and Coast 93.3. For more information contact Robert Paquette at (401) 667-6200 (robert.paquette@dem.ri.gov) or Terri Bisson at (401) 222-2776, ext. 4402 (terri.bisson@dem.ri.gov). 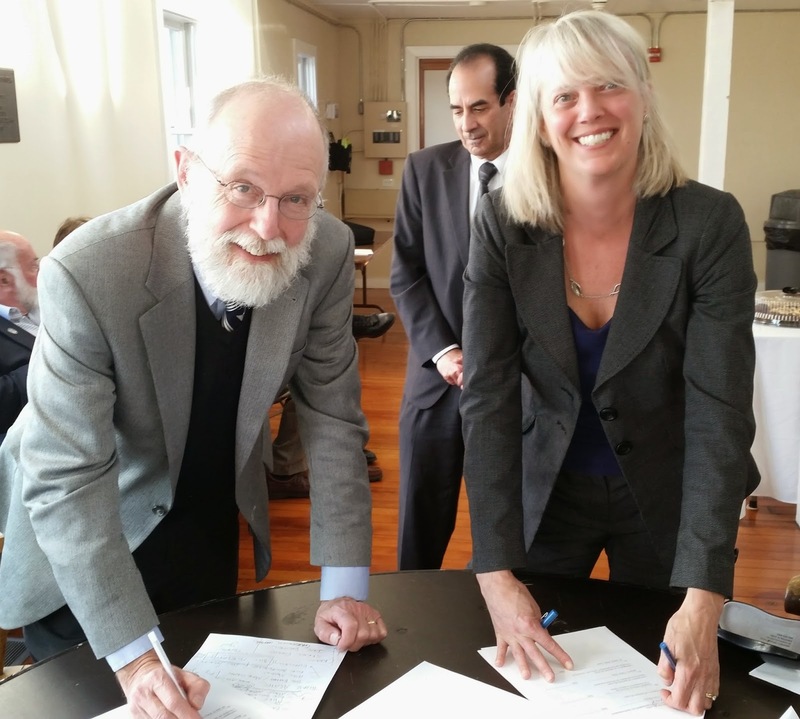 Signed, sealed, and delivered: Dean Bruce Corliss of the URI Graduate School of Oceanography and Janet Coit, DEM Director sign an agreement to form the RI Maine Fisheries Institute that aims to sustain fisheries in RI. Agriculture Day with an aquaculture twist: Speakers on Agriculture Day included Bob Rheault of Ocean State Aquaculture Association; Senator Susan Sosnowski, chair of the Senate Environment and Agriculture Committee; Janet Coit, DEM director; and Art Handy, chair of the House Environment and Natural Resources committee. The Department of Environmental Management (DEM) and the University Of Rhode Island Graduate School of Oceanography (GSO) announced the formation of the Rhode Island Marine Fisheries Institute (RIMFI) which is a research collaboration that aims to sustain fisheries in Rhode Island. RIMFI will coordinate marine fisheries science, research and educational activities. It will serve as a link between marine fisheries programs at DEM and URI serving as the focal point for collaboration with the Rhode Island commercial and recreational fishing communities. The formation of RIMFI was announced Monday at an overview session at the URI Bay Campus Mosby Center which included an agreement signing ceremony with URI Graduate School of Oceanography Dean Bruce Corliss and DEM Director Janet Coit, followed by words of support from Congressmen James Langevin. The primary objective of the new Institute is to develop and undertake innovative and practical fisheries research projects that will contribute to the scientific understanding and sound management of the marine fisheries resources of the State and region, and to the economic growth and stability of the commercial and recreational fishing industries that rely upon those resources. Professor Jeremy Collie, URI Graduate School of Oceanography, worked with DEM’s McNamee to develop the Institute proposal. Professor Collie said the projects developed by the RIMFI will be collaborative in nature with Rhode Island’s fishing industry, both recreational and commercial. The ideas for the collaborative projects will be developed through steering meetings to be held between the RIMFI and Rhode Island fishing industry stakeholders. Representatives from the commercial and recreational fishing community were well represented at the meeting. Steve Medeiros, president of the RI Saltwater Anglers Association said, “We plan to participate in Institute input sessions and provide substantive research recommendations that would help us understand our fisheries better.” Rhode Island Marine Fisheries Council (RIMFC) members in attendance (including me) were happy to see the formation of the Institute. The hope is that research that is better coordinated will lead to better information to make fisheries management decisions. The RIMFC makes commercial and recreational fishing regulation recommendations to DEM. “(The Institute) is a model that puts Rhode Island’s best foot forward: marine fisheries scientists, researchers, and managers from the state agency and the state university, working together with industry to develop strong science to inform the fisheries management process and achieve robust and sustainable fisheries,” said DEM Director Janet Coit. Scup season opened May 1st and anglers are starting to target them check www.dem.ri.gov for scup, saltwater and freshwater fishing regulations. Freshwater fishing remains very strong with largemouth bass being caught in many places throughout the state. 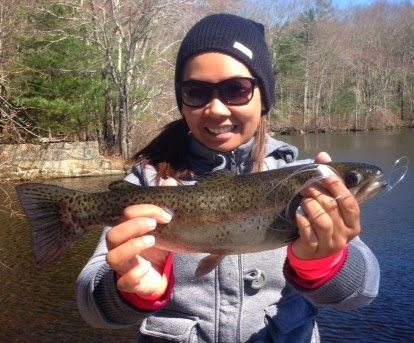 Trout fishing is particularly good at lakes and ponds that have been stocked by DEM (visit www.dem.ri.gov for a complete listing). The Atlantic States Marine Fisheries (ASMFC) will hold its spring meeting in Alexandria, Virginia May 12 to 15. The ASMFC sets fishing policy and regulations that Rhode Island must follow on a variety of spices. Agenda items worth noting include a review of spiny dogfish (an alternative proposal is being submitted for RI by Robert Ballou of DEM); a workshop on the Magnuson-Stevens Reauthorization Act; striped bass catch and release fishing is being considered in the Exclusive Economic Zone (EEZ) as well as a Technical Committee report and consideration of draft addendum IV on striped bass for public comment. I will have a report on meeting highlights as they become available. 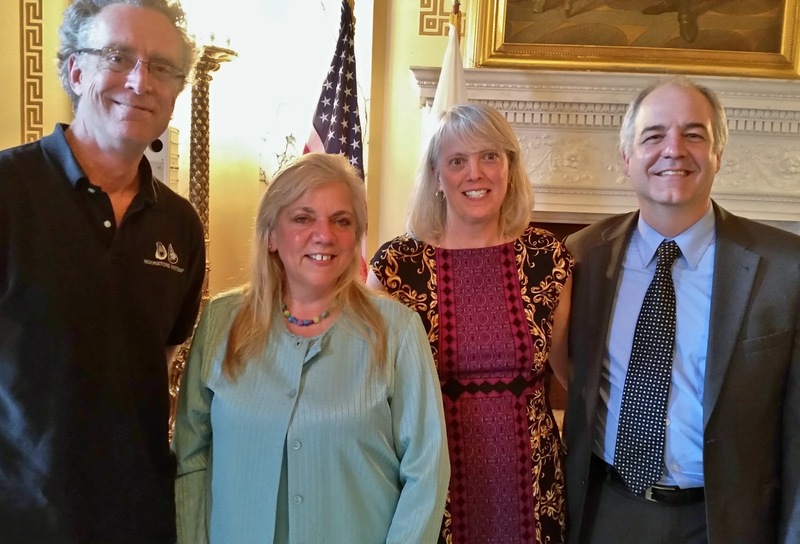 The Rhode Island Department of Environmental Management (DEM) along with local farmers, aquaculture associations, universities and government agencies celebrated RI Agriculture Day (and aquaculture), May 1st in a big way. Forty eight exhibitors displayed and served their products at the Rhode Island State House. Trout fishing good. Molly Ean of Providence, an associate at Ocean State Tackle, caught this trout over the weekend at a small pond in Exeter, RI. Catch big bass with lures. Noted surf fisherman Steve McKenna, Cranston, said, “Bucktails do not look like anything but resemble everything.” McKenna spoke Monday at a RISAA seminar. Jamestown cod. 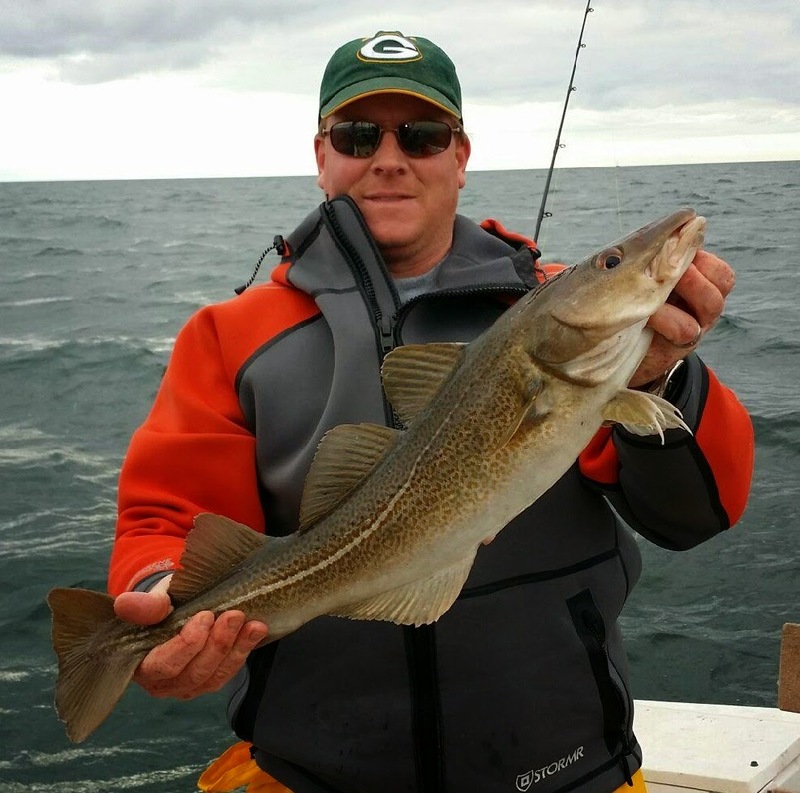 Chris Lundin of Providence caught this 25” cod this weekend. “The water was clear but only 44 degrees and Chris caught just the one cod.” said Dave Henault of Ocean State Tackle. The last thing you want to do is loose a big fish (any fish for that matter) due to faulty gear or tackle. Experts suggest checking all reels, rods and line before the season starts and to perform regular maintenance throughout the season. Replace line, repair line guides on rods and perform reel maintenance twice a season if necessary, particularly on those rigs that get a lot of action. Give your reels a good cleaning, particularly when the line is off. Grease where directed by manufacturer, often times this is marked on the reel. If instructions are long gone, ask your local bait shop where to grease. Do not grease the drag, it is not meant to be greased, if you do, it will not work. “Today’s fishing reels have more moving parts than ever… more parts with dissimilar metals, and this is how galvanic corrosion sets in.” said Mike Bucko of Bucko’s Tackle Service, Fall River, MA. Anglers should wash reels with soapy water after each use, rinse and dry them… but this is not enough to prevent galvanized corrosion. Bucko said, “Only an internal cleaning can prevent corrosion.” His company totally dismantles reels, puts all parts through an extensive cleaning process and then reassembles the reels for use. Visit them at www.buckoparts.com. Each year, replace used line. This is a judgment call as to what is meant by “used”. Braid line I spooled on two reels at the end of last the season was still OK, however, I took line off line at the beginning of the reel that was showing wear. Cross braid line when spooling onto conventional reels to prevent the line from digging into the spool when a big fish is on. Another tip is to re-spool lead line putting the used portion on the reel first, this way you use line that is new as most anglers rarely use more than three to four colors (90’ to 120’) of line. Replace monofilament line on reels at the start of the season. Monofilament line has memory so it tangles easily and creates bird nest tangles when it is old or has been sitting in the cold. Also stretch the line, the first 100 feet (of monofilament line) to relax its memory and avoid tangles. When you change line spool tight or the line may slip on the spool. To prevent braided line from slipping first spool some monofilament backing to the reel, tie line together, then spool the braided line onto the reel. Examine the rods for cracks and stress marks. Closely examine the eyes for chips or cuts that could cause line to snag, rub or break. Do not place hooks on the eyes or they will eventually create cracks that will cut line as it passes through. Place baits at the base of the reel when traveling to avoid banging and microscopic cracks in the rod blank that could lead to a broken rod. I get tackle ready in chronological order when certain species are fished… in this region that means starting with tautog, then striped bass, fluke, bluefish, sea bass, etc. Make sure you have enough rigs to fish the species. Often hooks that come with lures are not quality hooks so I replace them with stronger hooks. Use wire leaders for blue fish and monofilament or fluorocarbon for striped bass, fluke, sea bass, etc. Blues won’t bite though the wire and other species will find it harder to see the monofilament or fluorocarbon leaders. During the season make sure leaders have no nicks or stress marks from fish pulling. If they do, replace them. All hooks should be sharp and rust free. “Free fishing weekend (this weekend, May 3rd and 4th) is a terrific incentive to get outdoors and try something new, especially after the long, cold winter we’ve endured this year,” said DEM Director Janet Coit. For the fifth year, DEM fish hatcheries are offering anglers the chance to catch a coveted golden rainbow trout. Ponds receiving the golden trout include Brickyard Pond in Barrington, Peck Pond in Burrillville, Browning Mill Pond in Exeter, and Silver Spring Lake in North Kingstown. Instead of holding a central event this year, they will be stocking these fish in several ponds across the state so that more Rhode Islanders will have an opportunity to fish for the golden trout. Lucky anglers who catch a golden trout during the free fishing weekend and throughout the season will be given a free golden trout pin. Take a picture of your catch and send it to Kimberly Sullivan of DEM’s Aquatic Resource Education program at Kimberly.Sullivan@dem.ri.gov. DEM announced that the stocking of trout will be suspended at the Carolina Trout Pond, Richmond, until dam repairs can be made. Anglers are being asked to stay off the dam. At press time, the Department of Environmental Management’s Marine Fisheries Division, was just about to announce final 2014 fishing regulations approved by director Janet Coit. The final regulations are a reflection of what was approved by the Marine Fisheries Council in April. Complete regulations for all species can soon be found on www.dem.ri.gov or on the RI Saltwater Anglers website at www.risaa.org. Highlights on five popular species are noted below. Striped bass: Status quo with last year’s regulations, 28” minimum size, a possession limit of two fish/person/day. No closed season. Summer flounder (or fluke): Status quo with last year’s regulations, 18” minimum size, a possession limit of eight fish/person/day. May 1 to December 31 season. Black sea bass: The minimum size is 13” with a shorter season for the first sub-period due to a needed 7% reduction by the ASMFC. Season runs from June 29 to August 31 with a three fish/person/day limit. The second sub-period would run from September 1 to December 31 with a seven fish/person/day limit. Scup: 10” minimum size with the 30 fish/person/day limit with a May 1 to December 31 season. The bag limit for party and charter boats from September 1 to October 31 will increase to 45 fish and then back down to 30 fish/person/day from November 1 to December 31. The 9” minimum size Special Area Provision for shore anglers that was engaged last year for the first time has been expanded to include all of the 2013 areas… India Point Park, Providence; Conimicut Point, Warwick; and Stonebridge, Tiverton as well as new areas including Fort Adams, Newport; Fort Wetherill, Jamestown; the East and West Walls at the Harbor of Refuge, Pt. Judith/Narragansett; and Rocky Point, Warwick. Tautog: The spring season ends May 31 so now is the time to fish for tautog as they are illegal to fish June 1 to July 31 during spawning season. Fish have to be sixteen inches. The catch limit for private recreational anglers from April 15 to May 31 and then August 1 to October 17 is three fish/person/day, which jumps to six fish/person/day on October 18 to December 15 . There is a ten fish per boat per day limit in all periods. The boat limit does not apply to charter and party boats.